Condo, 3 Bedrooms, 3 Baths, (Sleeps 8) Max Occupancy =8 including all children. Awaiting you at the Sea of Cortez with beautiful views of San Carlos and the Tetakawi Peak; across the bay is a condominium with classic Mexican finishes, yet all the modern conveniences you are used to at home. This condominium provides unobstructed views of the ocean. Located upstairs, this is a two level condominium, so the views are vast. The upper level is a master suite with its own balcony and bathroom. Very romantic. The lower level has two bedrooms, a living area, and a kitchen, with a great balcony. Luxurious linens appoint all beds. The kitchen will exceed your expectations with everything you need to create gourmet meals. Wireless internet is accessible throughout the condominium. DirecTV satellite, flat screen television and a DVD/CD player provide movies, sports, music, news and weather for your entertainment. Custom mesquite furniture from central Mexico compliments the hand-made Mexican finishes that abound in the condo including mesquite doors and cabinets, Talavera tile, and iron chandeliers. Only a lawn separates our condos from the white-sand beach. A short shell-hunting stroll south brings you to the protected estuary filled with cranes and a variety of underwater wildlife. A walk to the north brings you to great food, beverages, shopping, recreational activities, and local life in the town of San Carlos. The historic fishing town of Guaymas, where there is an international airport, is an interesting destination only 10 minutes drive from Bahia Delfin. Don’t miss this opportunity to discover that new special vacation spot! 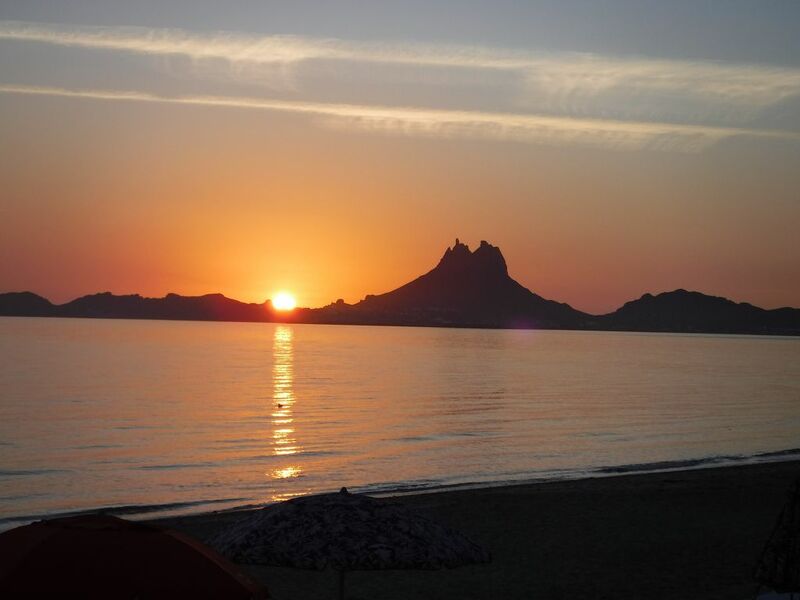 We are 15 minutes from San Carlos and 15 minutes from Guaymas. Our stay was very nice! The condo was very comfortable and had everything we needed. Condo was stocked with everything we needed for a great vacation, I have been staying in San Carlos for over 20 years and can honestly say this is one of the best rentals in the town. We really enjoyed our stay. The place has great amenities and great access to the beach. The owner responded right away to all my concerns and questions. The condo comes equipped with everything we needed. Nice location. Set up well. Great place. Loved it. My only suggestions are to fix the kitchen sink so the faucet moves and maybe to consider a king bed upstairs coupled with a tv in that room. The only real negative note is that the microwave lost power somehow and was never fixed during our stay despite notification. Thanks for the suggestion on the kitchen sink. That'll be added to our to-do list next time we're down. The microwave was replaced this past Monday. I let a renter know that it was dead so he offered to take a new one down for us. Many hands make light work! We'll look into your suggestions for the master bedroom also! Thanks for the honest review. We were pretty disappointed in this particular condo. There were no supplies (ie. supplies. Very uncomfortable furniture. 2 shabby beach towels for a 3 BR condo. Broken garbage disposal. Slow draining sink and showers. Loose floor tiles. Grubby cooking pans. Charcoal BBQ with no charcoal. If you arrive on a weekend housekeeping is not available to help you with supply issues. Beware that the "impact fee" of $100 is not part of the nightly quoted rate. We are happy to split your payment up in to two or three installments if needed. Just let us know before making a reservation request because we cannot adjust anything once that has been started on your end.